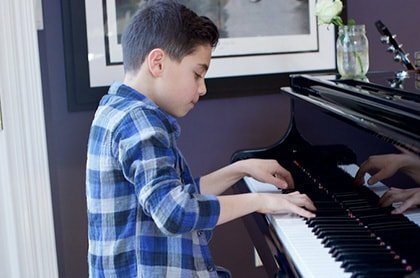 Why Take Online Violin Lessons From Music to Your Home? Learning to play the violin is a challenging undertaking for even the best students so finding the right teacher to instruct you is critical. This is especially true for children, as your child’s teacher has the ability to make or break their enthusiasm for the violin. We all have memories of “that one teacher” who really made a certain subject come alive because of their passion. A great teacher should be able to communicate with their student with both creativity and clarity. A great violin teacher is someone who has the educational background, the teaching accolades, and an impressive performance history. They should be someone who inspires their students to reach higher. The problem is, many families find themselves limited in their choices for violin teachers to work with. It can be hard to find someone with the right qualifications who is a good fit to work with your child. This is why Music to Your Home is excited to now be able to offer our online violin lessons. Why Choose Online Violin Lessons? Convenience is the number one reason most of our clients choose to pursue online violin lessons. You can learn to play the violin from the comfort of your own home. All you need is your violin and a Wi-Fi connection to get started. Online lessons will allow you the freedom to learn at your own pace. This is ideal for younger children who may be nervous when they are just getting started. And of course, online music lessons mean that you are not limited to the narrow selection of violin teachers that live near you. Our teachers have the exceptional skills, training, and expertise to help you learn to master the violin. When you partner with Music to Your Home, you don’t have to wonder if you are getting the full value of what you are paying for. Our in-person hiring process ensures that we work with only the very best violin teachers in the New York area. Our teachers have performed around the world with groups like the New York Philharmonic, the New York City Ballet orchestra, many Broadway plays, and many top charting artists. We are so excited to finally be able to share our incredible New York City teachers to students around the world through our online lessons. Our lessons range in length from 30 minutes to an hour. You will choose the type of lesson you prefer, pick your teacher, and pay for your lesson online. When you meet with your instructor, they can observe you play and offer feedback on ways you can improve. If you still have questions, please contact us for more information on how you can get started with Music to Your Home.